Call 1-800-229-5350 day or night! This policy is in effect for all Paragon Technologies Locations. This includes Paragon Great Lakes, Paragon Canada, Paragon Atlantic and Paragon Pacific. Our fully qualified and certified technicians rarely make a mistake. However, because they themselves are not robots, once in a great while something doesn’t come out the way you expected. If you should ever experience this rare occurrence, please follow the instructions, below, to obtain full credit for your return and replacement. 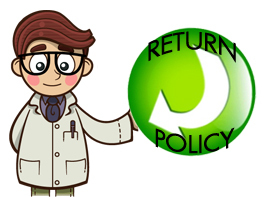 All original equipment, components, manuals, cables, documents and packaging must be returned with your item in order for us to process your return. Physically damaged items cannot be returned. This fee will be waived if a replacement unit is ordered at a comparable cost. Removal or alteration of a product's serial number or part number/sticker will automatically void the Return Policy. Products that are returned with a missing, damaged or altered number will be refused RGA service and returned to the customer.